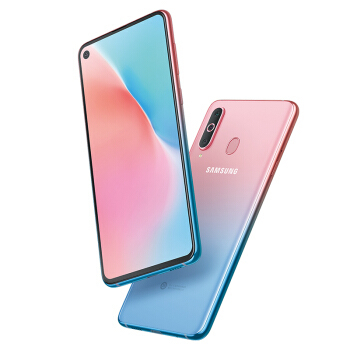 Samsung Galaxy A8s in Unicorn Edition Launched in China - Playfuldroid! In December 2018, Samsung had launched the Galaxy A8s as the first smartphone with Infinity-O display. The handset was introduced in three colors such as Blue, Gray and Green. Later the company had released the female focused Galaxy A8s Female Edition. Now the company has released a new color variant of the phone called Unicorn Edition. The new color edition of the smartphone is a color gradient that offers a mix of pink and blue. The Galaxy A8s Unicorn Edition is now listed on JD.com. The 6 GB RAM variant of the phone is listed with a price tag of 2,799 Yuan (~$410). Its higher 8 GB RAM variant carries a price tag of 3,099 Yuan (~$456). The smartphone features a 6.4-inch IPS LCD display that produces full HD+ resolution and an aspect ratio of 19.5:9. The Snapdragon 710 mobile platform and 6 GB of RAM powers the Galaxy A8s smartphone. The internal storage of the phone is 128 GB. There is a microSD card slot on the device. On the backside of the phone, there is a triple camera module which includes a 24-megapixel main sensor with f/1.7 aperture, a 10-megapixel telephoto lens and 5-megapixel depth sensor. It features a front-facing camera of 24-megapixel. It is packed with a 3,400mAh battery that carries support for 18W fast charging.